It's only taken 4 years to get these shots up on the website! 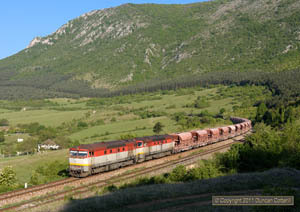 They cover the electrified east-west main line in the area around Strba, where the line runs close to the High Tatra mountains, the electrified lines to the Ukrainian border east of Kosice, including the 5' gauge line, and the diesel worked lines north and east of Presov. 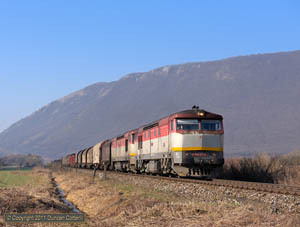 The lines around Zvolen and Banska Bystrica in south-central Slovakia provide the photographer with plenty of scenic locations, a high proportion of loco hauled passenger trains and some freight workings. In spite of the recent introduction of modern class 840 railcars and the beginning of electrification work on the line between Zvolen and Banska, there's still a lot to see and photograph. These pictures were taken during May 2003.